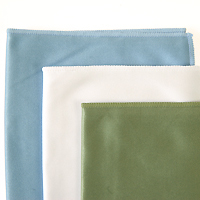 This 6" x 7" microfiber cloth is slightly thinner than our other Silky Microfiber Cloths. It is washable, reusable and long lasting. Save on disposable products and cleaners. Uses include: lens cloth, small LCD displays, cameras/camcorders, cell phones, optical/sun/safety glasses, LED read-outs/gauges, CDs/DVDs, industrial critical cleaning and more. Logo and size options available. 2,500 case pcs: 33 lbs. Pros: Soft, smooth, washable Cons: Might shrink a bit. Not really a con to me, but maybe to you. 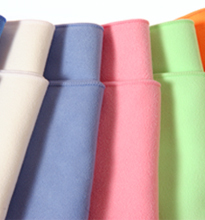 I use these cloths for the detailed care of acrylic art pieces, and they are perfect for the job. I like that they are relatively thin, so I can feel texture through them more so than with a thicker cloth. They also wash well - no unraveling or pilling. (They may have shrunk a little though.) I will continue ordering these great little cloths! Thanks, Deborah! We'd love to see your artwork!